Nathan S. Davis Elementary, Mahalia Jackson Elementary, Charles Carrol Elementary, Roberto Clemente High, and five other Chicago schools will receive funds from Chance’s non-profit. After an "unsuccessful" meeting with Illinois governor Bruce Rauner on the Chicago Public Schools funding crisis, Chance the Rapper held his own press conference last week, announcing that he would be donating $1 million to CPS and calling on businesses to help support. 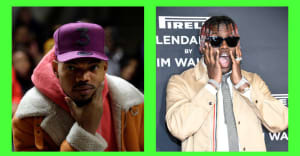 In addition, Chance promised that, for every $100,000 pledged by businesses, his Social Works organization would donate $10,000 to select Chicago schools, beginning with Westcott Elementary where the press conference took place. On Thursday, Chance took to Twitter to list nine CPS schools that would be receiving $10,000 donations from Social Works. The schools include Nathan S. Davis Elementary, Mahalia Jackson Elementary, Charles Carrol Elementary, Roberto Clemente High, Paul Robeson High, Orr Academy High, Hirsch Metropolitan High, Benito Juarez Community Academy, Fenger Academy High, and more. Presumably, these donations mean that companies have donated at least $900,000.